Thunderbay Press’s ‘How to Build Dream Cars with LEGO Bricks‘ aims “to deliver accurate car models of epic cars”, and it really does feature some epic cars. From legendary American classics like the Ford GT40, Dodge Charger and Corvette Stingray, through European supercars such as the Lamborghini Countach and Porsche 911, to modern-day exotic hypercars like the Pagani Zonda. Epicocity achieved then, but how about accuracy? Well Mattia is so confident in the realism of the builds within ‘How to Build Dream Cars’ that the contents page doesn’t name them, or even feature colour, instead showing simply black and white renders of each of the models featured. It works too, creating a beautifully clean look that is maintained throughout the book. The models are indeed instantly recognisable, at least for car fans which we suspect you’ll be if you’re reading this. LEGO’s own Speed Champions sets are too of course, and we’ve loved seeing each new release in this line-up as LEGO create more partnerships with real-world car manufacturers. However there are many brands that LEGO have not yet partnered with (and may never), and often the sets can be quite sticker-heavy, making recreation from spare parts at home impossible. ‘How to Build Dream Cars’ manages to accurately recreate some of the world’s best known cars without a single sticker, whilst using more advanced techniques to achieve greater realism than LEGO’s Speed Champions sets. Let’s take a look at how! Each model starts with a description and image of the real car, including the all-important fact sheet that all car fans require. The instructions continue the black and white theme and add colour simply via the bricks used in the build. Like Mattia’s ‘Tiny LEGO Wonders’ book, these are slightly more complicated than those found in an official LEGO set, both because the techniques themselves are, and because LEGO have simplified their own steps, sometimes to the point of adding just one piece at a time. ‘How to Build Dream Cars’ feels more like LEGO instructions did a decade or so ago, being noticeably more advanced, and using more monochrome piece colours. This means that there are few contrasting-colour pieces in hidden places (as LEGO now use to make them easier to find/identify), which is appropriate given most builders will be creating these models from their own parts and black/grey is a safe bet. Ingeniously the book also contains a complete parts list (which can be dropped straight into Bricklink should you need to buy them) and video instructions for each model, accessible via the QR Codes printed inside. This makes creating the models in ‘How to Build Dream Cars with LEGO Bricks’ a properly interactive experience should you wish it to be, and makes us wonder why LEGO haven’t done this themselves. Graphics are excellent, and whilst black-on-black isn’t quite as easy to follow as LEGO’s white-pages the instructions are well laid out, clear, and printed in high quality, with good visuals for sub-assemblies and piece positioning. Most importantly the results are superb, successfully mixing System and Technic parts to recreate the iconic shapes of some of the world’s most famous dream cars, such as the AC Cobra pictured below. LEGO are a roll right now with their ever-expanding line-up of officially licensed vehicles. However there are many more amazing cars out there not yet licensed to become official LEGO sets. If you’d like to expand your own car collection by building some stunning real-world replicas that LEGO haven’t yet created themselves (and that are more detailed and more advanced to build to boot), ‘How to Build Dream Cars with LEGO Bricks’ fulfils the brief brilliantly. From vintage classics to modern supercars, Mattia and Vince have created an excellent instructional guide to building your own dream cars at home, with enough technical specs and vehicle history to keep car fans happy too. That the book also contains complete parts lists, video instructions, and looks beautiful is the icing on the cake. Highly recommended. Visit Brick Passion to buy your copy. We’ve been a bit lazy on the reviewing front here at The Lego Car Blog of late. We do have a large review coming, but in the meantime our pals over at, er… BrickPals, have joined us to add another LEGO set to our ever-expanding Set Review Library (which is now contains over 100 reviews!). Over to Jack from the BrickPals team…. Hey guys, Jack here, and today I’ll be bringing you a review of LEGO’s 42065 Technic RC Tracked Racer, a set first released in 2017. Featuring some 370 pieces, 42065 retails for £74.99 in the UK, $99.99 in the US and 79.99€ in Europe and comes with a range of Power Functions parts; an IR receiver, a remote control, a battery box and 2 medium motors. With that in mind it seems like great value, but how good is the racer itself? This is your pretty standard Technic box with the orange Power Functions strip on the side. Opening it up you’ll find three bags. Two have parts and smaller bags in them, and the other contains the Power Functions components. Interestingly, the battery box was not included in this bag and instead is loose inside the box. You start off by building the base of the racer. This is very straightforward and provides no real interesting building techniques but a sturdy support for what’s to come. Next, the battery box, receiver and two medium motors are added. I was a bit surprised that the receiver was mounted on top of the battery box, but this does not interfere with the removal/inserting of the battery pack. After this, we start to build the outer layer of the racer. This is built separately from the existing build and uses white and green panels to achieve the desired shape. A few interesting techniques are used when constructing and angling the ‘bonnet’. Two clear pieces sit at the front and represent lights – I was impressed with how well the angles line up to the triangular green pieces. There are nine stickers to be applied to the racer, and these are all added on to this green shell. This is somewhat frustrating as it means many stickers applied one after the other, due to no stickers being placed on the chassis of the car. The completed and be-stickered bodywork is then attached to the chassis of the car at the front, where it can hinge roughly 160 degrees at the point it sits above the battery box. This was a very straightforward build, predominately for one reason – this set’s main purpose is to be a remote control car, unlike other Technic sets which attempt to replicate different functions of a vehicle. So how does it drive? There is one medium motor which powers the left track and another medium motor powering the right. These are connected to the IR receiver which is connected to the battery box. The remote control communicates with the receiver. There are two levers on the control, and they each control one motor. To go forwards, both levers must be held in the forward position. To go backwards, both leavers must be held in the backwards position. This is pretty simple, but what happens if you want to turn? Assuming the racer is driving away from you, only holding down the left control will make it turn right (so you’re essentially ‘dropping power’ on the side you want to turn). If the racer is coming towards you and you want to turn right, you hold down the right control. The opposite applies in both cases for turning left. Anyways, it takes a while to get used to the steering – especially for someone like myself who’s built RC cars where one motor does all the turning and the other powers the two back wheels. It’s Review Time here at The Lego Car Blog, and for those of you who’ve been reading reviews of LEGO’s large expensive sets and wondering ‘But what about something I can afford?’, this one is for you! 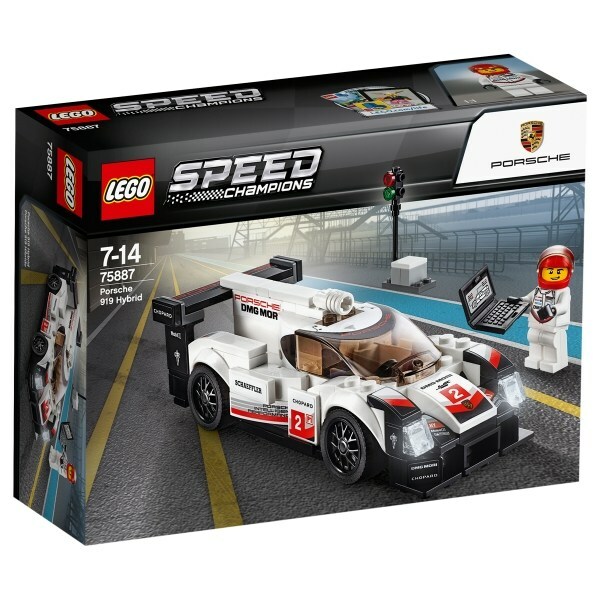 75887 is another result of LEGO’s tie-up with Porsche, which most famously brought us the 42056 Technic 911 GT3 RS set. Aimed at ages 7+, measuring just 6-studs wide, and costing around $15/£12, 75887 is a very different offering to the enormous 911, but it’s no less authentic. The build itself takes only around 20 minutes, and includes some lovely SNOT techniques to create the smooth, almost studless aesthetic. As always the instructions are beautifully clear, if a bit over-simplified as has become the way with them these days, and they utilise a few odd-coloured pieces in hidden places, presumably to make the images easier to follow. There’s nothing wrong with that of course, as it possibly means builders will acquire a wider range of parts in their collection quicker, but was it really that taxing when everything was black or grey in the old days? The resultant shape is pretty good, with any strange colours perfectly hidden from view, and a wide array of curves, bows and tiles used to recreate the 919’s bodywork with reasonable accuracy. The authenticity is further enhanced by no less than twenty-four separate stickers, some of which are no bigger than a stud, and the placement of which takes up around half of the 20 minute build-time. Applying these may be a little tricky for those at the younger end of 75887’s age range, and to be honest the set probably doesn’t need all of them, but it’s nice that LEGO went all-in! 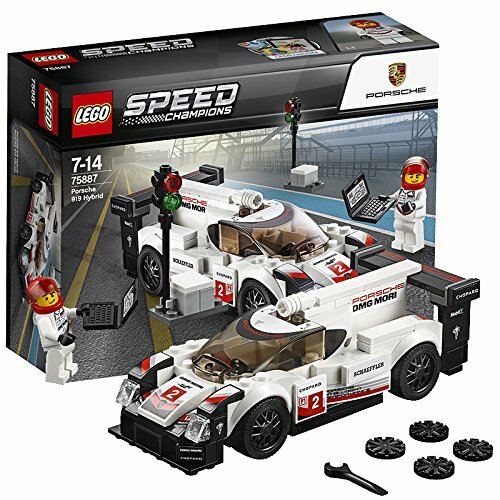 After much peeling, placing and sticking you’ll have really rather lovely replica of the Porsche 919 Hybrid, (even if it’s a bit stumpy when compared to the real car), that can be zoomed beautifully across a desk and will survive the inevitable plummet to the floor intact to boot. 75887 is probably not the most accurate officially-licensed vehicle in the Speed Champions range, but it’ll be good enough for the target audience, it’s a fun (and reasonably technical) build, and if you like stickers (and what 7 year old doesn’t?) it has them in abundance! A worthwhile starter set, 7/10. Thanks to the geniuses over at Brick Insights, the awesome new LEGO Review Aggregator, we’ve learned that we have reviewed 99 official LEGO sets, books and third-party products here at The Lego Car Blog. From LEGO’s first brick-based offerings right up to their newest releases, there’s something for everyone in our Set Review Library. However we’d like to make The Lego Car Blog’s Set Review Library even more comprehensive, and to do this we’d like your reviews! Payment is made in the form of everlasting fame* and TLCB gratitude, and your words will reside in the Library for all time, being read by up to a million visitors a year at the time of writing, which is pretty cool. If you own a LEGO set that we hasn’t yet been reviewed by our crack team of ‘experts’ and you think it deserves a place in The Lego Car Blog’s archives (for good or for ill!) then get in touch – we’d love to hear from you. We’re particularly looking for Technic, Model Team and Creator sets from 1990 to current. The Brick Insights team will even automatically add your rating to their Review Aggregator tool so you can see how your thoughts compare with other review sites. Here at The Lego Car Blog our Set Review Library, where almost a hundred LEGO sets and related products have been reviewed by our, cough… ‘experts’, plus a few readers too, is easily the most popular area of the whole site. Despite an inconsistent scoring methodology, and with some very probably written drunk, the value of the Library proves how important reviews now are. From holidays and restaurants to electronics and sports, there’s probably nothing you wouldn’t buy without checking out the reviews first, and that of course includes LEGO. But should you trust what we write? Not a chance! Well, not on our own at least. That’s where Review Aggregators come in, pulling reviews from multiple sources to give a far more balanced overall score. The most famous of these is probably the Rotten Tomatoes movie review aggregator, a gem of a tool to peruse before you spend your hard-earned on a movie ticket. But what if you could do the same for LEGO sets? Well now, thanks to the chap pictured below, you can! It’s been a while since this picture was taken. I had moved around a lot, gotten married, and we were pregnant with our son, so adulting made LEGO hard to prioritise. I really wanted something to build to relax and fill the time, so I went to the store and browsed the LEGO aisle. And felt really, really lost. Since I was in a grey age I hadn’t followed the latest releases, and I had a hard time figuring out what to buy. I went home, explored a few different parameters that might be important when buying a set, and built a mockup. In my head I called it ‘shouldibuythisset.com’. Not that catchy – really glad I changed the name. I figured that the easiest MVP I could build while still being useful, is to gather reviews for all of the sets. This way I could figure out what other people thought about the set, and if I knew I trusted one reviewer more than the other, I could pay extra attention to that person. It all went from there. Eight months later and we’ve got a site that automatically picks up new reviews from qualified reviewers (like TLCB! ), calculates average scores for each set, compares them per year and all time, and does other cool calculations too! The long term goal of the site is to help people like me figure out if a set is worth the money. After building my simple prototype I went back to the store and purchased the Ninjago Katana, a set I wouldn’t have looked twice at otherwise. It’s a cool set and I’m glad I picked it up. That’s what I hope the site can do more and more as I continue working on it. Above is the Brick Insights 42054 Technic Claas Xerion 5000 page as an example, with an aggregated score of 94/100 from nine review sources (of which we’re one), and comparisons to the averages across the range and the year in which the set was released. Each of the reviews listed is hyperlinked to the source site, and each reviewer has a page too with their own averages, number of reviews and scoring distribution (we learned that we have 99 reviews, 71% of which are scored, and that our average score is 7.8/10). Brick Insights‘ graphics, animations and navigation are top-notch, and each new review uploaded by their chosen sources will be automatically added to the relevant set and reviewer pages, changing the relevant statistics too. You can find The Lego Car Blog’s Brick Insights page by clicking here, and we hugely recommend taking some time to explore the site – it’s going to be worth its weight in bricks. It’s time for another LEGO Set Review here at The Lego Car Blog! It’s big, it’s blue, and it’s an officially-licensed replica of an awesome real-world vehicle. OK, it isn’t that big blue officially-licensed Technic set, but it is quite an exciting product nonetheless. BMW’s Motorrad division has made some mighty products over the years, from the ridiculous 200bhp S1000RR (until recently the fastest production motorbike in the world) to some of the finest long-distance adventure bikes ever made. 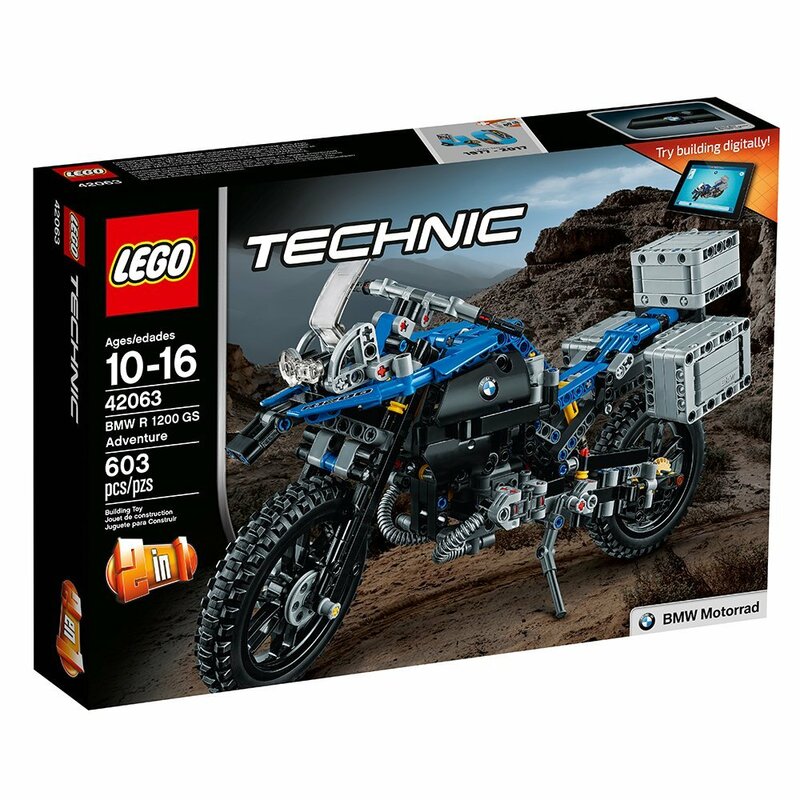 It’s the latter LEGO have chosen for the 42063 set (although we hope an S1000RR will follow! ), and since our Set Preview back in 2016 we’ve been itching to get our hands on it. Containing 600 pieces 42063 joins LEGO’s ever expanding line-up of officially-licensed replica vehicles, a range that we think is the best decision LEGO have ever made. 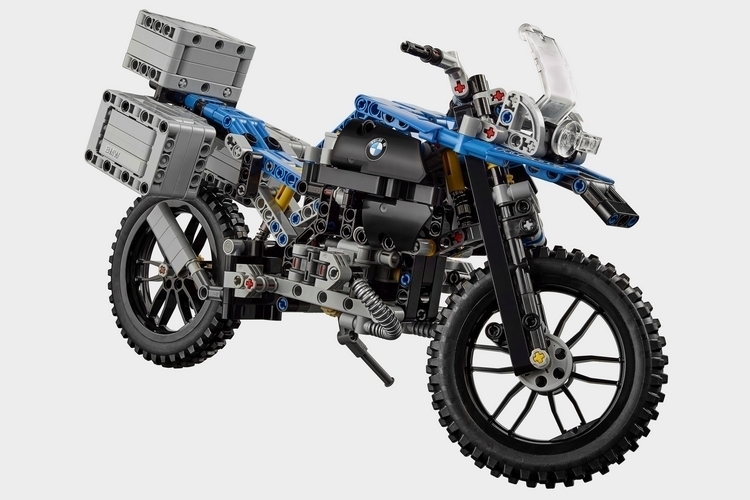 The instructions feature exactly 200 steps to turn a pile of blue, black and grey into an authentic replica of BMW’s desert-crossing motorbike. Well, not just blue, black and grey, as like some of LEGO’s other recent Technic sets 42063 contains pins, connectors and axles in almost every possible colour. There’s even a brown one! This is to make finding said parts easier (with the side benefit that the instructions are clearer to read too), and it doesn’t impact too much on the finished aesthetic, but this TLCB Writer is from a time when every single Technic part was either black or grey, and he managed OK. What’s wrong with teaching kids perseverance? Anyway, upon emptying all that lot on to the floor it seemed that around a third of the parts were black Technic connection pins, which may help to explain the decision above. In fact there are 123(!) of them, which we suspect might be the greatest ratio of pins to bricks of any Technic set ever. As always the instructions are masterfully designed, combining single-part steps with more complicated sub-assemblies, and they make the building of 42063 both pretty fun and reasonably challenging too. There’s a 3-hole Technic beam printed with the 40th Anniversary of Technic decal (which is pretty pointless but a nice easter egg) and a cool-looking sticker sheet with a raft of BMW/GS/R1200 decals so there can be no mistaking what you’ve built. Our BuWizz arrived a simple cardboard box, packaged only with a little piece of paper denoting the required warnings and LED indicator meanings. The BuWizz brick is a clever thing, incorporating both a rechargeable li-ion battery and a bluetooth control into one 8×4 stud box, reminiscent of LEGO’s own battery boxes from the 1980s. There are studs on top, tubes on the bottom, and four Technic pin holes with which the BuWizz can be attached to genuine LEGO pieces. Our BuWizz came in a dark grey hue that we don’t think matches any of LEGO’s colours, but seeing as it can be mounted internally within a creation an exact match isn’t required. The moulding quality is OK, perfectly adequate for the job in hand, but certainly not as good as an official LEGO piece (or the rival SBrick reviewed here previously). On top of the BuWizz are two connection ports, a status LED, and four LEGO Power Functions compatible power outlets. You must charge your BuWizz upon arrival via a micro USB, which the pack does not contain. This is a bit of a shame as it means the device is not truly plug-and-play, requiring a lead from something else in order to charge. We found a lead, plugged in the BuWizz, which let us know it was charging via the LED on top, and busied ourselves for a few hours. Upon returning to our BuWizz a green light indicated we were ready to go. Like the aforementioned SBrick, the Buwizz brick uses an app to connect your phone or tablet to itself. The app is an easy download and connects the device seamlessly. Within it are six pre-programmed control interfaces available to operate your model. Each requires a small amount of set-up so that the app knows which of your motors is connected to which port which is simple enough, although there is no ‘test’ function as per the SBrick, which would be useful. It’s time for another Review here at The Lego Car Blog. However we’re not reviewing an official LEGO set, or even an official LEGO product. After several days of fun… er, we mean ‘arduous testing’, we can bring you a full review of one the most important products to enter the Lego Community in years. This is TLCB’s in-depth review of the SBrick bluetooth control. Regular readers of this website will know that remote control vehicles appear here frequently. This is thanks to LEGO’s excellent Power Functions system, which upon its release in 2008 allowed builders to easily motorise and remotely control their creations via infrared receivers. It was an instant success, and – judging by the amount of Power Functions equipped vehicles that still appear on these pages – it’s a product that shows no signs of waning. Launched a few years ago the SBrick by Vengit removed the need for infrared control by bringing bluetooth to LEGO’s Power Functions system. This means that models can work in bright sunlight, there’s a huge 50m range, and – of course – that Lego creations can be controlled via any bluetooth enabled device, including your phone, tablet or gamepad control. The SBrick itself is a wonderfully neat bit of design. Measuring sixteen studs square it’s no bigger than LEGO’s own infrared receiver, however with no, er… infrared receiver to worry about, it can fit twice the number of outputs – effectively doubling what your model can do. Plus as bluetooth uses UHF radio waves the SBrick can be completely hidden from view deep within a model – unlike LEGO’s infrared receiver which must have a line-of-sight to its controller in order to collect the signal. Our SBricks arrived in grey, being a good colour match to LEGO’s usual Technic hue, and both looking and feeling high quality. In fact the only way the SBrick differs visually from an official LEGO piece is with square studs instead of round. The SBrick can connect to LEGO pieces in the same way that the official infrared receiver does, via studs on top, tubes on the bottom, or via Technic pins/axles on the sides. The SBrick must be connected to a power supply – in our case LEGO’s own Power Functions Battery Box – via a LEGO extension wire, at which point a green light appears to tell you power is being received. Of course to control an SBrick-equppied creation you will need a bluetooth device. There’s no need for LEGO’s infrared controller, which can be replaced with any number of bluetooth enabled products. We selected an iPhone, downloaded the SBrick app, and got to work! The app is a quick and easy download and install, and allows you to log in as a guest, or to set up your own SBrick account where you can create and save your own model profiles. We created a model profile for our previously reviewed LEGO 42030 Volvo 350F set and started looking through the various pre-programmed templates. The ‘Joysticks and Sliders’ seemed like a good fit and within minutes we had successfully set our Volvo up to drive, steer, raise, lower and tip its bucket all via a mobile phone! There’s a direction reverser should forwards turn out to be backwards and an ingenious ‘test’ button which gives the motor selected one second of power so that you know which one you’re setting up. Scrolling through the Brick Badger website can be a dangerous business, especially if you haven’t bought any new bricks for a while. It was a dull Sunday afternoon at TLCB Towers. The Elves had decided to find out which colour of 32009 Technic beam could do the most damage when beaten against a colleague’s head (medium lilac apparently). We were wandering the interweb and spotted the 42062 Container Yard was nearly 40% off on the famous riverine retailer. The set contains 631 pieces, including a selection of beams in LEGO’s standard blue and orange colours, plus eight, grey 64782 flat panels. Not owning the 42056 Porsche 911, a source of orange Technic pieces is always welcome and the grey panels looked like they’d come in handy for making neat bases for MOCs. There’s also one of the new worm gears and a good number of 18654 (15, plus spares). LEGO insists on calling these 1×1 beams, despite the pieces obvious inability to perform this engineering function. The most obvious new pieces in the set are the 18942 and 18940 Gear Rack & Housing. It will be interesting to see what use MOCers come up with for these parts. The set continues Technic’s trend of axles coming in a variety of colours: red, yellow and brown in this case. Building the models is the usual, enjoyable adventure with Lego. There is a very nicely produced instruction book for both the main build and the B-model. The different colours are well differentiated and the days of dark grey and black getting confused are long gone. The parts come in numbered bags; building the tractor unit, the trailer and finally the telehandler. It took us a couple of hours of building and tea-drinking to complete the build. Builders at the youngest end of the suggested age range might find this quite a marathon of building and concentrating. Perhaps an advantage of this set is that you can build the lorry (and pause to play with it), build the trailer (and pause to play with it) and finish off with the telehandler. We certainly did! As you would hope from a set with two different models, there are a good variety of mechanisms for young (and old!) engineers to build and play with in this set. Each vehicle has a different steering mechanism, plus the four-bar linkage that raises the arm on the telehandler, which also uses that new worm gear. Purists might be annoyed that the A model doesn’t use the gear rack to extend the telehandler’s arm. However, the B model does and the A model uses an interesting camming mechanism similar to the locking mechanism found in early repeater rifles. The container grabbing claw is another very neatly implemented version of a locking knuckle. For a set with a relatively small number of pieces there’s a lot here to inspire amateur engineers to experiment and build their own machines. Thump. It was just before Christmas, and a brown package slammed onto the hallway floor of TLCB Towers. A dozen TLCB Elves immediately ran towards it, but thwarted by its weight were unable to make off with their prize. A lot of post goes missing here. Fortunately this TLCB writer is considerably bigger than a TLCB Elf and thus was able to pick up said package and, with some Elves still attached, retreat to the TLCB ‘staffroom’ (an ancient sofa in the corner of the office). Usually heavy packages received here at TLCB Towers are ‘Cease and Desist’ notifications wrapped around a breeze block from The Brothers Brick, but this time we had a present! No Starch Press; we like you! No Starch have been in the Lego book game for a while, consistently churning out books about our favourite plastic building blocks for some years. Their latest publication is this, the 230-page ‘The Lego Trains Book‘ by Holger Matthes. In compact landscape format and produced in No Starch’s usual glossy high quality form ‘The Lego Trains Book’ really is surprisingly heavy, but does the content live up to the cover? ‘The Lego Trains’ book begins, after a brief Forward and Acknowledgements section, with a chapter detailing the history of LEGO’s official Trains line, following the range from its beginnings in the 1960s, through the battery era, live rail era (this writer’s favourite), to the latest remote control Power Functions sets. It’s a comprehensive compilation of the LEGO Trains history and one that’s sure to be of interest to anyone who loves the theme, although it is perhaps a bit too in-depth for the more casual Lego builder. Chapter two is entitled ‘Basic Principles’, and it’s brilliant. Detailing building techniques and parts ratios it’s perfect for any builder of any theme (not just Trains) looking to create more advanced Lego creations. Utilising well-chosen digital depictions the author makes even the more complex techniques easy to understand, and whilst these aren’t quite as high quality visually as LEGO’s own they are good enough to make for useful teaching-aids. Chapters three and four build upon these techniques with practical application, detailing the considerations and choices available when designing your own train models. This is a very thorough chapter offering insights into a variety of scales, how to ensure models can handle tight corners, how to connect carriages to one another, how to create realistic steam train mechanisms and such like. It’s a gloriously nerdy section and as such Holger includes links to third-party products and design software that can help a builder reach the utmost level of realism. This may be a bit too in-depth for most builders (ourselves included), but it’s usually better to have too much information than too little. Yes, it’s that Set Review you’ve all been waiting for; the 42058 Technic Stunt Bike! Ok, maybe not… But we have a copy, so we’re going to review it anyway, you lucky people! 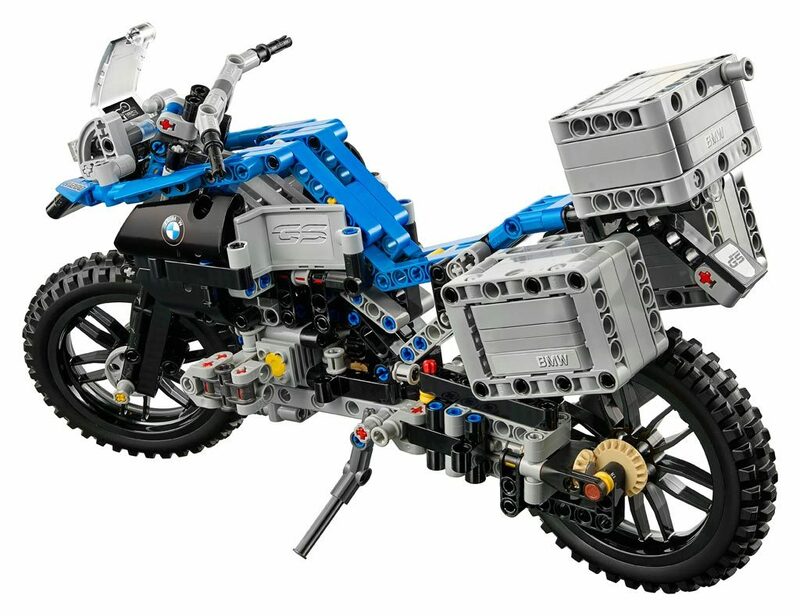 Launched at the start of 2017 the Stunt Bike and its pull-back twin form the entry to the LEGO Technic line-up. Aimed at ages 7+ they’re colourful, cheap, and very playable. The heart of 42058 and the part to which everything is attached is the pull-back motor, which powers the rear wheel via a set of gears. It works well enough and allows the bike to jump over the cardboard ramp that comes included in the set with ease, and thanks to the very un-motorcyle-like wheels it’ll stay upright nine times out of ten too (slightly less if you’re playing skittles with unsuspecting Elves). Aside from the pull-back motor though, that’s your lot, as there are no other working functions at all. That might be OK if 42058 looked like a real motorcycle, but due to the need to stay upright when being propelled by the pull-back motor, that’s not possible. Still, if you’re looking to start off in Technic building or you’re looking for a gift for a child ready to make the step up from City, Star Wars or Ninjago, you could do worse than the colourful and be-stickered 42058. You could also do a lot better. It’s the question receive more than any other here at The Lego Car Blog. Until now we’ve politely diverted people to the builder of their desired creation directly, knowing full well that instructions won’t be available and that they’ll leave disappointed. However we may now have an answer, thanks to Peter Blackert (aka Lego911) and Quarto Motorbooks and their new release ‘How to Build Brick Cars’. ‘How to Build Brick Cars’ – A book for all LEGO fans and petrolheads! First of all, I’m no pro in reviewing books, but I’m a big fan of LEGO and a petrolhead myself. I build LEGO cars as a hobby as well, so I can assure you that you’ll have a very interesting and unique experience with this book if you have any interest in LEGO and/or cars. There’s no more fun than building your own favourite scale model out of LEGO bricks yourself, rather than getting a die-cast model. ‘How to Build Brick Cars’ can help you to build some of the greatest vehicles ever made, from city cars to super cars, you’re sure to find something you like in there! What first took my attention of this book is the cover of it, very well designed and printed it gives you the expression that you’re dealing with a high quality product. That goes for the whole book as well, every single page is well printed, the pictures are very sharp and the instructions are clear enough and easy to follow, just read the ‘How to use this book’ section before you start collecting your pieces and building the models. Experienced Lego builders will be able to use the instructions without reading the introduction, but I would still encourage you to do so. This point leads us on to the content of this book, ‘How to Build Brick Cars’ is divided into three main sections, 1. Foundation, 2. Intermediate, and 3. Advanced. But before we look at these sections let’s talk about the first pages of the book and a bit about the author. Peter Blackert, who is very well known in the Lego community as “lego911”, is a prolific and talented Lego car builder. Fortunately for me I know him through Flickr, and although I’ve never met him personally I can assure you he’s a very nice person. I have always been impressed by the quality of his work and the ‘speed’ at which he builds his models! You might never believe me if I told you he can build a very nice and detailed car every day. No wonder he works as an engineer for Ford Australia! In the few first pages of ‘How to Build Bricks Cars’ you’ll find the introduction, ‘Why build brick cars’ and a detailed contents page so you can see what the pages of this book contain. Another important section is the ‘How to use this book’ page, as mentioned above, specially if you’re not an experienced Lego builder. Although the instructions are pretty clear and easy to follow they are made in a compact way to ensure the book is able to contain as many different models as possible, so you need to pay attention while putting the pieces together, but for me that adds to the fun in the process! 1. 1932 Ford V8 Roadster. 2. 1932 Ford V8 Coupé. 6. Jaguar E Type Coupé. 7. Jaguar E Type Roadster. After the few introductory pages you’ll find the first main part of the book, the ‘Foundation’ section, in which you’ll find instructions for seven very detailed and accurate small scale cars in a scale of 1:28. Being small scale doesn’t mean they’re simple to build though, they are still challenging and big fun! The models in this section range from cars as old as a 1932 Ford (above) right up to the latest Ferrari 488 GTB. My own favourite of the Foundation section is the Citroën 2CV Charleston. I built one myself (see below!) and noticed some very smart and interesting techniques and connections between the bricks all over the model, something you’d never guess just looking at the model from the outside. The second part of ‘How to Build Brick Cars’ is the ‘Intermediate’ section, where you’ll find some of the most iconic sports machines have ever made. The models in this sections are at a slightly larger scale of 1:20 (LEGO Miniland scale), with more advanced and complicated techniques than those in the previous section. They also include more detail and a few working elements too, including opening doors, hoods, trunks, even working suspension, afforded by the jump in scale. My favorite model of this section is the 240Z/Fairlady Z (maybe because I’m a big Nissan fan! ), it was a big joy to build and very satisfying with some superb techniques, details and features. Finally the third part of ‘How to Build Brick Cars’ is the ‘Advanced’ section, which features instructions for some of the fastest cars that have ever been produced. Fasten your seat belt and get ready for the adventure! As you’d expect, in the third and final section of the book you’ll find the most detailed and complicated Lego models. Whilst these models are at same scale as the previous section you’ll experience a much higher degree of build complexity utilising more advanced building techniques, enabling you to create an even higher level of engine and chassis realism. After building the cars in this section you’ll have gained more building skills and a greater breadth of techniques enabling you to build better models for yourself, plus of course you have some very nice models from the book to display on your shelf! When I was young, I wanted LEGO’s London bus set 384. Smart, red, and it looked like a Routemaster to someone like me who had never been to London and didn’t know it was modelled on the Routemaster’s predecessor, also manufactured by AEC, the Regent III RT. So I decided to make my own London bus, a full half-cab bus, and I made it 10 studs wide. Unfortunately I ran out of parts after the lower floor, so I didn’t bother making the stairs. My history with Lego buses is otherwise rather chequered. 696, a white and blue bus almost entirely unlike the Ulsterbuses I would later take to school, was given to me in the 1970s, and I bought the original Knight Bus 4755 in 2004, complete with beds racing all over the floor. I finally got my hands on 384 and, some time later another set I coveted for making models in the 6000 and 7777 Lego ideas books, 379, from eBay some years ago, and with at least one unique chassis part, 384 lives at my parents’ house. The 10258 London Bus box is the standard size for Creator Expert sets, and boasts two pictures of a real life Routemaster, as well as interior shots of the completed model. Opening up reveals what is a relief to those of us who have had to build and later rebuild a nephew’s Death Star after parts had broken off while moving house – numbered bags. The bane of many a builder’s life, but I’m fully sold on them for making it easier to find the piece you want. Call me a wuss if you want. The instruction book is 176 pages long – I have to say I like the single books. Looking at the sticker sheet though reminds me that the number plate is incorrect, because no UK numberplate runs to five digits. Of course, I’ve no idea whatsoever whether Morten Graff-Wang could have a personalised numberplate MGW258 or not, but GW was a South-East London registration. Anyway, back to the set itself, and I’ve thrown the bags for parts 2, 3 and 4 back into thebox to save space and leave me with four to cope with. And breathe. As you would expect, the chassis begins with Technic bricks and frames – all studded construction, of course, and establishing a strong foundation for the rest of the set. After 21 main steps the floor is laid, the stands for the seats are set up, the staircase has begun, we build the engine with grey bullion forming the top of the engine block, and finally it is time to start building bodywork. 4×3 panels provide most of the flat bits, with a hint of a curved back to come. As I build the driver’s seat I decide I’m glad I’m not driving this thing, as there is only one stud of leg room between the driver’s seat and the steering wheel and gearstick, and the seat won’t go back. And then it’s time to build the stairs! The construction is very straightforward – the end of each step is held in place with a single stud round plate. I don’t think the five resulting steps are quite enough, but shh, it’s impressionistic. The back of the bus includes a new 1x1x1 2/3 brick with two studs on the side, which match up if placed on top of the washing machine piece. It’s used to attach both rear light clusters – the left one directly, and the right one indirectly due to the curved corner I’m now expecting. You also get a yellow number plate option. A yellow fire extinguisher goes under the stairs (Hmm. Canary yellow is for hot oil fires. Who’s keeping a commercial deep fat fryer on a Routemaster bus?). OK, this isn’t a car, but it’s Lego Technic and it’s a vehicle. So, who cares…? When I saw TLCB’s preview for the first 2017 Technic sets I was a little disappointed by the picture of the 42064 Ocean Explorer. It was already written in the blogpost that the model looked more like a City set than like a Technic model, and there weren’t many Technic functions visible on the photos. Despite this, I really liked the look of the ship, so I thought that I’d give it a second look when the set became available in stores. When I finally saw the set I was pleasantly surprised; it really had enough functions to wear that Technic logo on the box. So I made a wish for my birthday and now I’ve got it! Ok, so what do we get? We get quite a big ship with a clean, studless, almost LEGO City like look. We also get a small submarine and a small helicopter. Each of the three models has one or more Technic functions. The scale is more or less in line with LEGO City, so if you like you can use a crew of mini-figures with it. First of all there is the ship, a big explorer vessel of the type you would expect to search for a sunken ship or to explore the deep sea fauna. There are three ‘hidden’ functions operated by ‘HOG’ gears on top of of the ship’s bridge. The first function is the steering of the ship. The model has four little wheels for smooth movement on the floor. The rear wheels have a steering function operated by the bigger gear mounted in the centre of the bridge. The steering is also connected to two steering rudders on the rear end of the vessel. The second and third function are for the operation of the crane. The crane can be rotated and lifted by turning the two smaller gears on the left and right side of the bridge. It works perfectly to drop the submarine into the ‘water’ and get it back on board. The second model is a little deep sea submarine. It’s quite small, but it has two Technic functions built inside. One gear is connected to the rear propellers, so when you turn it, they turn too, whilst the second gear is connected to a mechanism that opens and closes the pair of robot arms like a pair of pliers. With a little practice you can grab ‘specimens’ and bring them back to the vessel. The third model is a small helicopter. Even though it’s smaller in size than most LEGO City helicopters it has the typical Technic helicopter function of both rotors being connected to an ‘operation gear’ outside the model, allowing them to spin simultaneously. Both smaller models – the submarine and the helicopter – have a canopy big enough to carry a mini-figure, and by adding one or more ‘half pins with a stud’ you can even fix the figures inside. So, after all, the 42064 Ocean Explorer is really worth a second look, and for me it really was worth buying it. My son loves it, too. For him it’s like his LEGO City models, just better. I think it could also be cool to see all the functions of the vessel motorised with Power Functions elements (hmm, I think I see a new project appearing on the horizon…). Thanks to Nils O for joining us as a Guest Reviewer to add another set to the Set Review Library. If you’d like to write a set review as Nils has you can; simply get in touch with us via the usual channels.